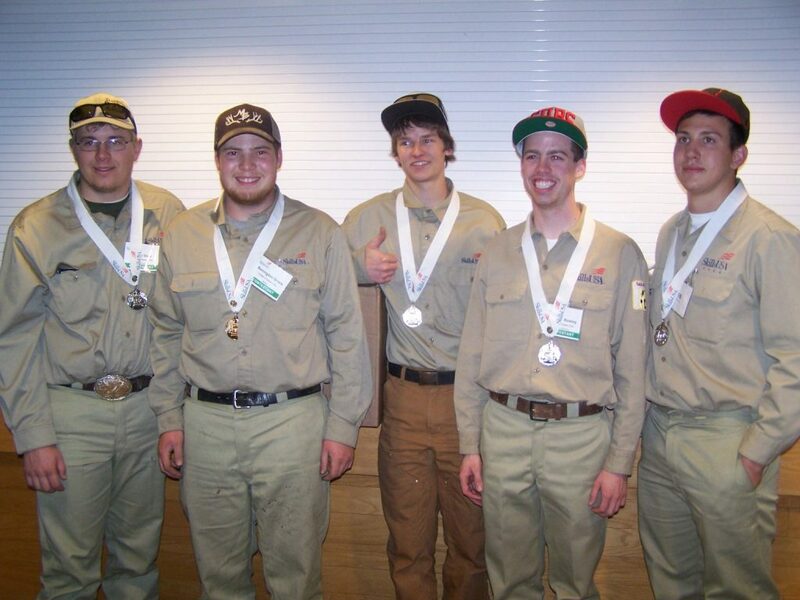 On a quest for another national title, USU Eastern welding students must qualify at the Utah SkillsUSA competition held in Salt Lake City where they compete against other college and high school welding programs in the state. The students performed well the state level by winning two gold medals and a silver team medal recently. They are sending the post-secondary division winner and secondary division winner to the national level on June 24-29 in Kansas City, Mo. Remington Grace, Ferron, earned a gold medal in post-secondary division while Austin Stout, Price, earned a gold medal in the secondary division. Instructors for the students are Mike Tryon and Lon Youngberg. “This will be the second year at the national competition for Remington. He finished in fifth place last year as a college freshman and we are hopeful for a national medal this year. Stout had a fabulous performance at the Utah competition where he competed against about 25 other high school welders. He won the competition by a wide margin. On a point basis, he would have placed third at the college level,” said Youngberg. This year’s fabrication contest was a different format than in the past and each team was only allowed one electrical connection. The USU-Eastern team struggled to keep the work flowing. “It was like something out of the Star Trek where Kirk keeps saying ‘we need more power Scotty’. Ultimately we just did not get the job done,” Youngberg added. Salt Lake Community College, the post-secondary winner, will have their job cut out for them to maintain Utah’s reputation as the state to beat at the national fabrication contest. Utah, via USU-Eastern, is the defending national champion for each of the last two years and has never failed to obtain a national medal since 2008 when the contest began, Youngberg said. SkillsUSA is a partnership of students, teachers and industry working together to ensure America has a skilled workforce. SkillsUSA helps each student excel. It is a national nonprofit organization serving teachers and high school and college students who are preparing for careers in trade, technical and skilled service occupations, including health occupations. It was formerly known as VICA (Vocational Industrial Clubs of America). More than 300,000 students and advisors are part of SkillsUSA with 17,000 SkillsUSA member sections (classrooms) in more than 3,700 schools (chapters) in all 50 states, DC and three U.S. territories. These schools are comprehensive high schools with career and technical curricula, regional career and technical education centers, and two-year colleges. Combining alumni and lifetime membership, the total number impacted this year is more than 330,000. SkillsUSA has served more than 10.9 million members since its founding in 1965.